People’s ideas of nature are multifaceted and they reshape the world in unexpected ways that defy economic explanations. While Americans’ ideas and uses for pumpkin have reshaped the physical form, their desire for pumpkin is also actually helping to revitalize small family farms and rural towns – ways of life the pumpkin has long symbolized. The nature of the pumpkin, the market, and its meanings together encourage its production by small-scale producers for a local market. The history of the pumpkin counters the common assumptions that romantic agrarian fables and imagery are tangential to actual agriculture practices and that capitalism spells doomsday for family farmers and rural America. Farmers and rural communities have relied on this old crop to become viable economic enterprises in the twenty-first century. Jack-Be-Littles are miniature pumpkins that weigh no more than a pound. They are edible, but they are often marketed as a "charming accent for fall centerpieces," that is, for their image rather than their meat. 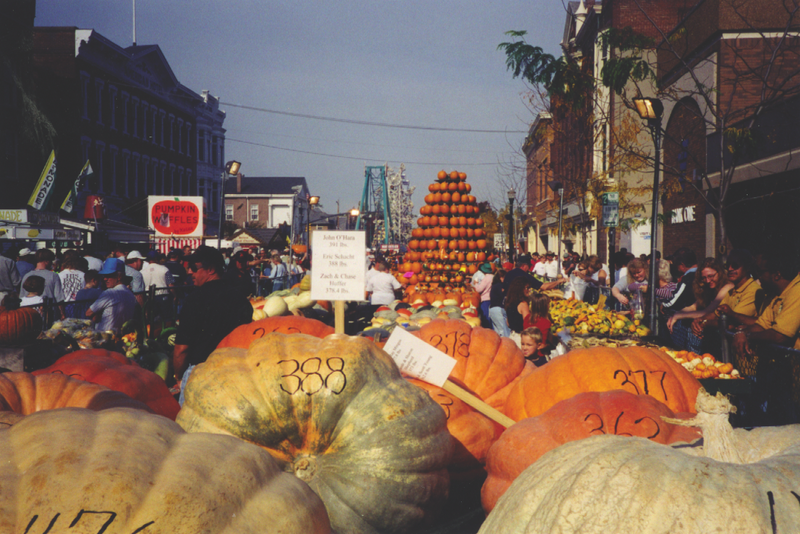 Circleville Pumpkin Show, Circleville, Ohio, October, 1999. Photo: Cindy Ott. Cox Farms Pumpkin Festival, Centreville, Virginia, October 2000. Photo: Cindy Ott.